Optics is an intrinsic part of many powerful and developing technologies in areas such as biotechnology, national security and manufacturing. However, there is a global shortage of optics technicians, which is hindering progress. To address this, Dr Alexis Vogt of Monroe Community College, Rochester, New York has created the OPT IN! program – a pipeline between high school, college and employment in the field of optics. According to the Encyclopaedia Britannica, optics is the field of science ‘concerned with the genesis and propagation of light, the changes that it undergoes and produces, and other phenomena closely associated with it.’ The terms ‘optics’ and ‘photonics’ in many cases are interchangeable, but photonics generally refers to applications in electronics and telecommunications. Optics is an intrinsic and indispensable part of innovation and design in several fields. 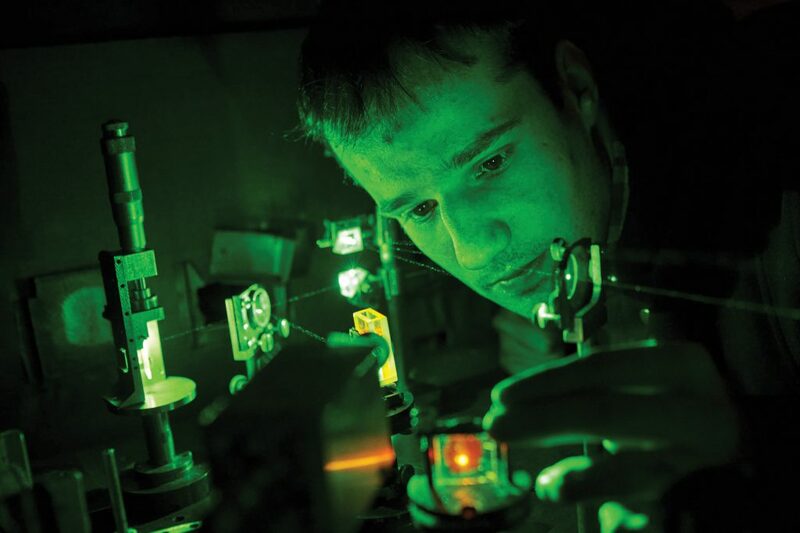 For example, research in optics has contributed to developing improved imaging techniques for biomedical applications, micro-fabrication and cutting techniques, national security-related devices and systems, credit card and banking systems and sustainable energy technologies, to name a few. Optics is a field of science that touches on many aspects of life and offers many benefits. However, the optics industry is facing a challenge. Despite significant growth – more than 3% per year – there is a shortage of skilled-up STEM graduates in the field. It is estimated that 20% of experienced technicians and engineers are approaching retirement and there are simply no students to take their place. To add some numbers to this situation, 75% of Upstate New York optics technician job openings go unfilled annually. Meanwhile, 75% of small and medium-sized German companies report their shortage of skilled optics workers inhibits their innovation. 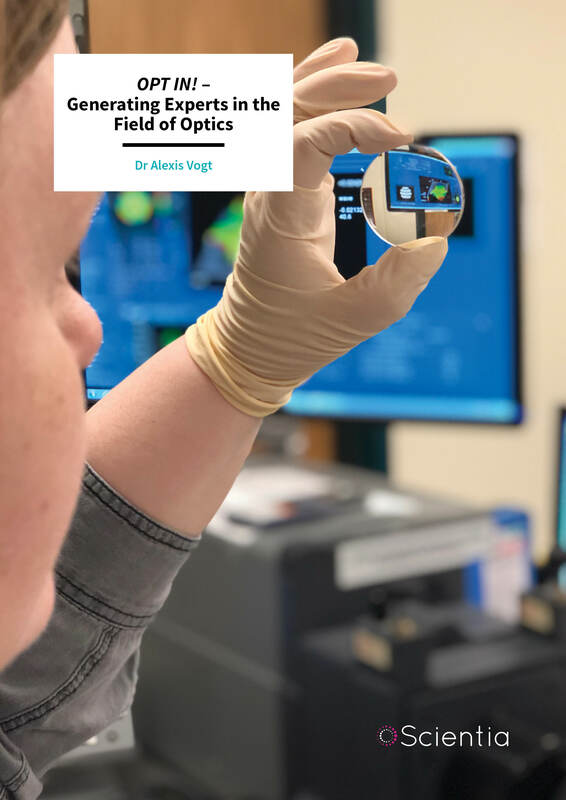 Dr Alexis Vogt of Monroe Community College in Rochester, New York sees education and training as integral to addressing the shortage of optics technicians. Monroe Community College has always focused on education and practical training. In 1971, the college created a two-year degree course for training technicians to work in the optics industry. And nearly 50 years later, the school’s optics program is still the nation’s only community college that awards associate degrees in precision optics. The optics program at Monroe Community College focuses on three main areas of training: fabrication, assembly and metrology (the study of measurement). 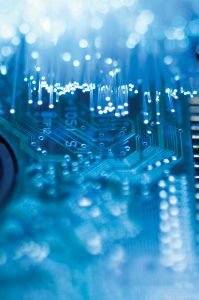 Over the course of their studies, students will have produced, tested and handled an array of optical components and systems – many of which are used in lasers and sophisticated photonic systems for homeland security, aerospace, biomedical equipment, digital displays, telecommunications and nanotechnology. 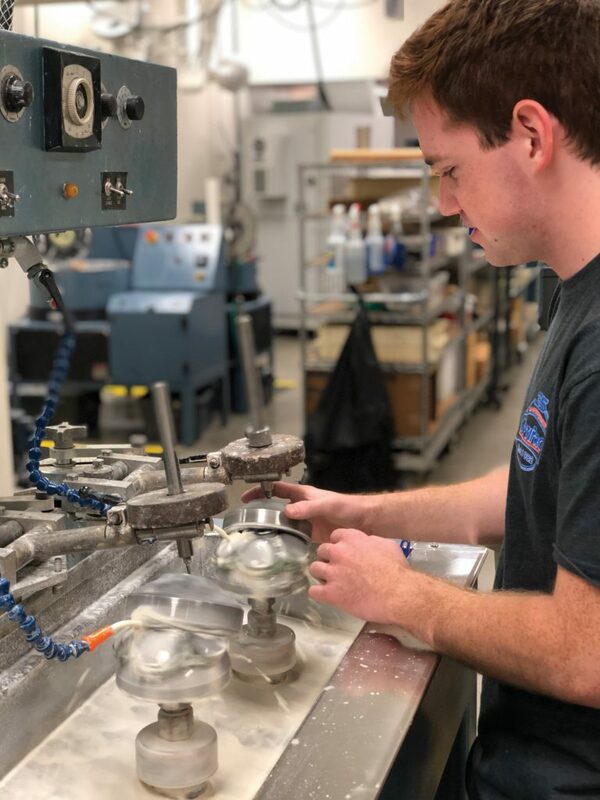 To support their learning, the college features well-equipped, state-of-the-art optical manufacturing labs where students are trained hands-on, in real-world settings. Optics students have three educational tracks at Monroe Community College: Optical Systems Technology Associate of Applied Science Degree, Optical Systems Technology Certificate and 2+2 Dual Admission at select four-year institutions. The two-year Associate of Applied Science (AAS) Degree provides a direct path to careers in optics and electro-optics/photonics. The one-year Certificate Program provides a background in optics to those currently working in a related field who wish to add optics to their competencies. Students intending to earn their Bachelor of Science Degree in Optics or Imaging Science can complete the first two years at Monroe Community College and transfer to complete their final two years the University of Rochester, Rochester Institute of Technology, or the University of Arizona. Dr Vogt wanted to build on Monroe Community College’s success and boost the intake of students into the program. To achieve this, she saw the need to develop an updated curriculum and implement a variety of course delivery models to promote learning and student retention. She also wanted to provide professional development opportunities and strengthen industry partnerships, to support each student’s transition into industry. With a grant from the National Science Foundation (NSF), she developed a targeted program – the ‘Optics & Photonics Technology INnovation’ or OPT IN! program. The vision of OPT IN! is to strengthen the regional optics and photonics workforce and provide students with employment opportunities in regional industries to fill high-skill, high-demand positions. It achieves this by educating and upskilling STEM students through professional development, strengthening industry partnerships and broadening community awareness of educational and employment opportunities. The program has several unique features that it brings to the table. For example, OPT IN! creates partnerships with high schools and assists them to integrate optics-related content into secondary STEM education. OPT IN! facilitates a unique dual enrolment initiative where optics courses are taught in high schools by qualified high school teachers, and students who successfully complete the course receive Monroe Community College credit. Moreover, to support transition to further studies, OPT IN! features summer internships and transfer opportunities between Monroe Community College and four-year institutions. Students may avail themselves of this provision if they wish to pursue a bachelor’s degree. Another noteworthy feature is that OPT IN! offers internship opportunities and expands outreach efforts to populations underrepresented in the optics and photonics industry, such as women, veterans and individuals from minority groups. To that end, OPT IN! has several recruitment, retention and outreach initiatives, including the development of a portable ‘Optics Road Show’ and other public presentations. Many of these initiatives have been tailored for women, African Americans, Latinos and those from low income backgrounds. OPT IN! began in April 2017 and is now well into its second year. Initial data and feedback has indicated that OPT IN! is already having a significant positive impact and achieving many of the goals that Dr Vogt set out to achieve. Broadly speaking, OPT IN! has assisted over 850 school and college students. In May of 2018, 17 college-level students successfully graduated from Monroe Community College’s two-year degree course in optics. This is a significant increase from May 2016, before the OPT IN! program had been implemented. On the high school level, 12 high schools are currently participating in the program and over 200 high school students are enrolled. ‘Hello Professor Vogt. I am happy to say I got the job with OptiPro. I will be an Advanced Process Development Lab Technician. I start on July 9th. I really appreciate everything you taught me and the position you put me in to succeed was great. Hope to see you around in the future in the well-knit optics community!’ – Justin Arrajj, working at OptiPro. ‘Professor Vogt, the end of the semester came fast, and I did not get a chance to properly thank you for all your help, support, guidance and knowledge shared throughout my time in the optics program. I truly believe the time spent in the program was well worth it and that it was the push I needed in the right direction for my future. As a job update, I did accept a full-time position at RPO as an Optical Technician.’ – Salaahuddin Karim, working at RPO. Dr Vogt hopes to improve the program, with an emphasis on increasing enrolment and graduates. But the question remains, even with a two or three-fold increase in graduates, would it be enough to fill the void of technicians? The answer is likely no. Dr Vogt feels that other institutions and industry partners need to get involved and create further opportunities, as Monroe Community College programs alone cannot provide the needed number of highly-skilled precision optics technicians. Dr Vogt does acknowledge, however, that OPT IN! would be challenging to replicate elsewhere, especially because Monroe Community College has built a reputation of excellence and has thoroughly refined optics education. Industry partners, who already have the knowledge and resources needed to train students, are seen as an integral part of moving forward. Thankfully, companies share this vision and are implementing training programs in optics. Optimax Systems Inc in Ontario, New York, offers three-year accredited apprenticeship programs in optics where apprentices spend a month working in different manufacturing areas across the company, whilst taking optical systems technology courses at Monroe Community College. Corning Incorporated created a Technician Pipeline Program which includes a two-year scholarship to earn an AAS Degree in optics from Monroe Community College, a $25,000 annual salary while in the program and a full-time technician role with Corning Incorporate upon completion of the degree. Optimax and Corning are not alone. Other optics companies, including JML Optical, OptiPro Systems and SCHOTT AG, are working on implementing their own apprenticeship programs. A serious shortfall of optics and photonics technicians exists. To address this, passionate students of STEM are needed, and they need to be encouraged to take up careers in these fields. Education and training, with appropriate support and incentives, are key. Building on an established reputation for excellent optics education, that’s exactly what Dr Vogt, Monroe Community College and OPT IN! have set out to provide. So far, the program has been exceptionally successful. This is evidenced by increased participation and graduation rates, growth of industry partnerships, and most importantly, feedback received from students themselves. Many have already secured positions in the optics industry and with more apprenticeship programs in the pipeline, this will surely continue. Monroe Community College continues to work with optics companies to achieve the best possible outcomes for students. These measures will undoubtedly increase the intake of suitable STEM students into optics-related fields of employments and research. Given the vast array of applications, these students are sure to make a difference. 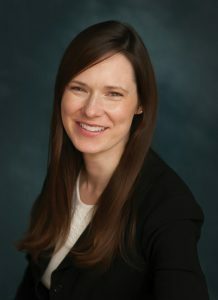 Dr Alexis Vogt received her PhD in Optics from the Institute of Optics at the University of Rochester. She currently serves as Endowed Chair and Associate Professor of Optics at Monroe Community College (MCC), State University of New York. Prior to joining MCC, Dr Vogt was the Applications and Business Development Manager at Melles Griot, and prior to that, designed contact lenses and intraocular lenses for Bausch + Lomb. In addition to her industry experience, Dr Vogt holds three patents and has authored numerous research papers and other publications. She has even authored the definitions of ‘light’ and ‘polarisation’ for The World Book Encyclopaedia. In recent times, she has been working on a program known as ‘OPT IN!’. This educational program provides professional development and training in the field of optics, strengthens industry partnerships and broadens community awareness of educational and employment opportunities.